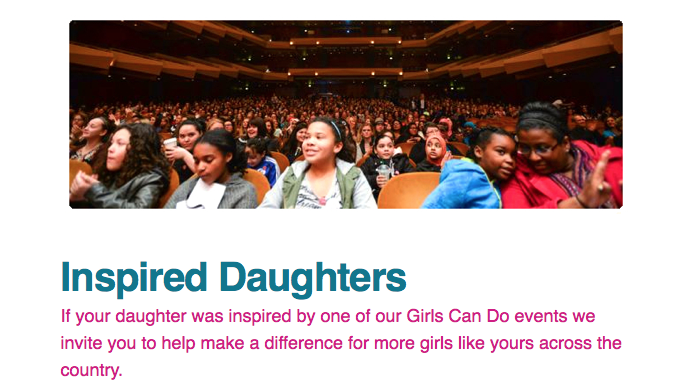 Girls Can Do has a Fundraising Campaign ready to turn our amazing organization into a National phenomena!!! We need your help! Our goal is $100,000 by July 31. This campaign is a one-time “seed” fund, required to keep our lean event planning team in action for the next two events. After that, our events will be sustainable through our event sponsorship model. Your donation of any amount will go a long way toward making a difference in the lives of girls and creating a world of equal opportunity. You can make your donation on our secure Campaign Website. On behalf of Girls Can Do, thank you for being a Possibility Thinker.